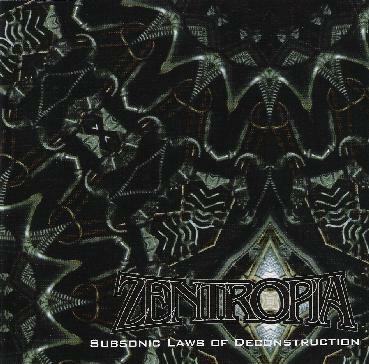 Zentropia - "Subsonic Laws of Deconstruction"
What kind of music do you think you will experience with Zentropa??? Well, experimental electronic spaced out music of course. The duo of Mark Bray and Darcy Rowley have unleashed quite a monster of a CD. This is for the deep space adventurers. They make very cool use of the mixer as sounds and guitars are flying all over the place. While some of the stuff is pretty slow going, there is an underlying intensity in their sound that is very unique. If you have a subwoofer on your stereo, be quite careful as the bottom end can be quite lethal! This is the duo's fourth release and if you go to their web site you can see they are into a lot of different cool events in the music world, including live webcasting. Excellent stuff. Old school industrial music meets dub in space. For more information you can visit the Zentropia web site at: http://www.zentropia.com.